The Golden Currant is a magnificently flowering shrub, with yellow tubular flowers that are present in Spring. The flowers attract for various bird and butterfly species. In the mid to late spring the flowers set to delicious red berries, providing a good food source for birds, mammals, and other wildlife. 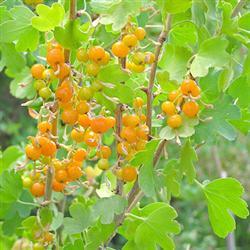 Golden Currant is one of own favorite native edibles and makes great jams, or is just great for snacking on. The yellow flowers add a bright touch to a garden in springtime.